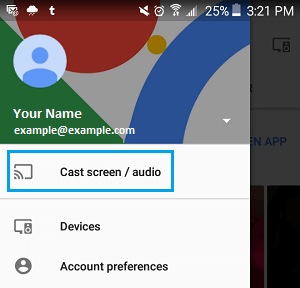 Google’s Chrome browser has an in-built “Cast” option, which should allow you to watch Videos playing on the Chrome Browser of your Android Phone on the bigger screen of your Television. However, the “Cast” option of Chrome browser does not appear on many websites. Hence, we are providing below two different methods of Casting anything playing on the Chrome Browser of your Android Phone or Tablet onto the bigger screen of your Home TV. The Google Home App allows you to Mirror anything playing on the Chrome Browser of your Android Phone or Tablet to the screen of your Television connected with a Chromecast Device. In order to use this method you will need Google Chromecast device connected to your Television and Google Home App downloaded and installed on your Android Phone. 1. 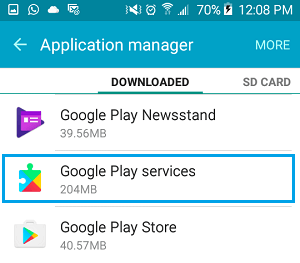 Download and Install Google Home App from Google Play Store on your Android Device. 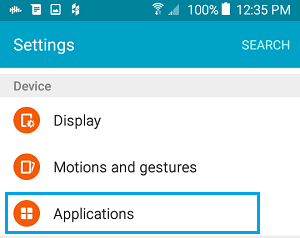 On some Android Phones, you may see a blue Cast Screen/audio button. 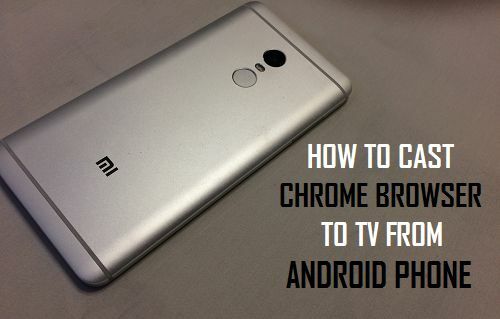 Tap on it to begin the Process of Mirroring the Screen of your Android device to TV. Now you should be able to see the screen of your Android Phone or Tablet mirrored onto the screen of your TV. Any app you open on your Android Phone or anything you do on your phone will be mirrored onto the screen of your TV. 6. Open the Chrome browser and visit any website or play any video and it will also be mirrored onto your TV. The Cast Screen/Audio feature should work on any Android device running Android 4.4.2 or later. According to Google, the user experience will vary, depending on how well your Android device has been optimized for screen mirroring. During our testing, Xiaomi Redmi Note 4 Phone kept disconnecting, every time we tried to Mirror its screen to TV. Luckily, we were able to fix the problem by using the steps below. 5. 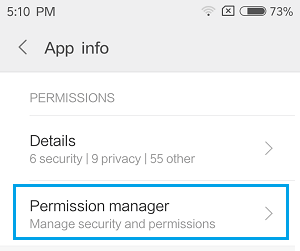 On the next screen, tap on Permissions Manager or just Permissions on some devices. 6. 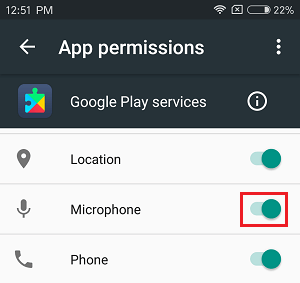 On the next screen, enable the option for Microphone by moving the Toggle to ON Position. 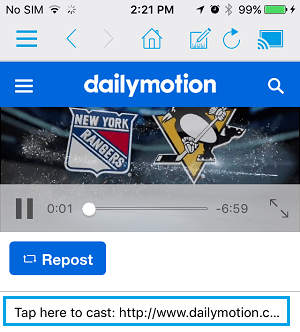 Another way of Casting Chrome Browser on your Android Phone or Tablet to the Screen of your Television is by making use of the Video & TV Cast App. Just like the previous method, you will need a TV with Chromecast device, in order to use this method. 1. Open Google Play Store on your Android Phone or Tablet. 2. Download and Install Video & TV Cast App for Chromecast on your Android Device. 3. Next, open the Video & TV Cast App on your Android Device. 4. The Video & TV Cast App should immediately connect with your Chromecast Device. 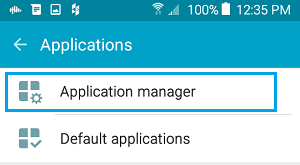 To confirm, take a look at your Android Phone and see if you can find a Cast icon on the screen of your Android Device (See image below). If the Cast button is coloured blue, then your Chromecast is indeed connected with the Video & TV Cast App (See above image on the right). 5. Once you tap on the Cast button, you will see a pop-up. Tap on the Name of your Chromecast in the pop-up. 6. Next, visit the website which contains the video that you want to watch on your TV. 7. Now, start playing the Video that you want to cast to your TV. 8. As the Video begins playing on your Android Phone, you will see Tap Here to Cast link below the Video playing on your Android Device (See image below). Compared to the mirror your screen feature in the Google Home app the TV & Video Cast app is limited, as it only allows you to cast videos and not web pages. Another disappointment with the TV & Video Cast app is that the free version does not allow users to Pause, Forward or Rewind Videos. However, you can get this feature by making an In-App purchase of $1.99.